An I.N.O.X. watch has to survive 130 tests before it is released. Discover some of the challenges it has to master. In celebration of Victorinox's 130th anniversary, we created 130 tests which our I.N.O.X. watch had to survive in order to ensure lasting quality and reliability. Coming up with such an innovative model required 4 years of thinking, 3 years of extensive development, 6 months of harsh testing and 421 samples. Half of them completely crashed in the process! We filmed some of the tests – check them out and let our I.N.O.X. impress you. A ten meter drop basically means your watch is falling from the same height as a three story building. By the time it reaches the ground, it has a speed of 50 km/hour. Meaning the case better be sturdy to survive such a hit. You’re worried you might get stuck one day with your watch band and accidently break it? Won’t happen with an I.N.O.X. – we hooked a mountain rescuer to a helicopter with it and flew him over some glaciers. He enjoyed his flight very much. Watch the making of movie. To test whether an I.N.O.X. holds its promise after some good shake ups, we sent it down an Olympic course on a bobsleigh. And it still ticked. And despite all the vibrations, the bobsleigh’s driver was still able to tell the time. Thanks to the dial’s clear design. The I.N.O.X. has no problem withstanding a constant pressure of 8 tons. 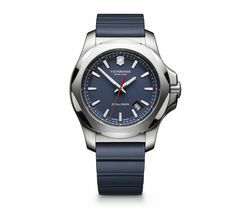 So a fire truck, a construction vehicle weighing 25 tons, or even a military tank weighing up to 64 tons all pose no real challenge for this watch. Why not challenge the I.N.O.X. with the test the US Army uses to check their missiles? Cool the watch down to -57 °C then give it a temperature shock by heating it immediately up to +71 °C. Obviously, no problem for an I.N.O.X. Why all these tests, François Nunez? Who came up with the idea to create all these crazy tests – and why? 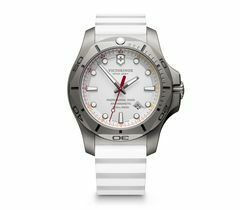 In 2014, to celebrate the 130th anniversary of Victorinox, we wanted to create a watch which reflects the unique values of the famous Swiss Army Knife: authentic, robust and reliable in all conditions. Coming up with such an innovative model required 4 years of thinking, 3 years of extensive development, 6 months of harsh testing and 421 samples. Half of them completely crashed in the process! How did you all create the tests? What inspired you? Are these tests standard procedure in the industry? Based on in-depth research, we established a list of technical elements that would ensure longevity and durability for this collection. We added 25 additional tests to the pre-existing homologation tests which we carry out on our regular products. The extra tests were extremely tough, ranging from a ten meter drop to enduring a sand storm, or from resisting acid to being put through a washing machine. The I.N.O.X. watch can also resist temperature extremes from -51°C to +71°C and withstand a centrifugal force of up to 12G. For example, our I.N.O.X. metal bracelet can survive 500,000 vibration cycles when a regular model can barely resist 50,000! Only once this extended list was completed and validated, did we start the design process. Were there any tests which the watch did not withstand? Which tests were the most difficult for the watch to pass? It’s impossible to imagine how much pressure we were under to come up with an I.N.O.X. 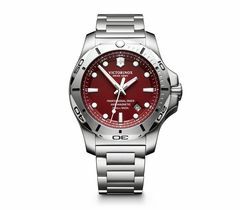 watch in our legendary Victorinox red. We had the right color but it needed to withstand 72 hours’ exposure to an extreme UV source. This was particularly challenging and was definitely one of the most difficult exercises in the testing process, as the color red is particularly sensitive to sun exposure. 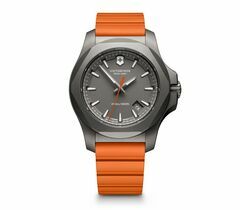 But luckily, our Victorinox Swiss Army technicians successfully rose to the challenge. How did the tests influence the design of the watch? 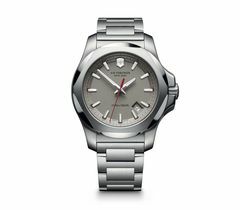 We had two questions in mind: What does it take for a watch to be a Victorinox watch? And what does it mean for a product to be truly durable and stand the test of time? The design process only started once the list of tests was completed and validated. 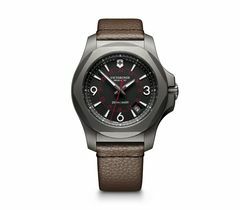 At Victorinox Swiss Army, that’s what we mean when we say function rules design! Even if I.N.O.X. is a technical product, we didn’t want to create a technical monster. We wanted a product to fit every possible occasion. Resistant enough for outdoor activities. Elegant enough to be worn when back in the office. There are different I.N.O.X. collections. How do they differ and why? When first released, exactly three years ago and after three years of intense development, our I.N.O.X. collection was primarily expressing an uncompromising level of quality and durability. 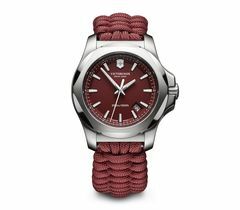 Functionality was precisely the value we decided to express through the product that was released shortly after the launch of the collection: an innovative Paracord strap solution that still remains exclusive to our brand. More than a strap, it is a multi-functional survival tool for those who love to live their lives in adventure mode: a bow drill for making fire, a fishing net or a shoe lace. Ultimate functionality also was at the center of the development of our I.N.O.X. Professional Diver range. A professional watch that proved we are as serious about producing functional tools as we are about qualitative timepieces. Finally, three of our latest additions to the I.N.O.X. family prove that being one of the toughest watches ever imagined isn’t a final destination for Victorinox. With our innovative titanium finish, our carbon watch case and a space-tested Technora Paracord strap, we once again demonstrated our pioneering spirit and endless quest for innovation. We always said that the I.N.O.X. V, designed for ladies and released last year, celebrates contemporary women. The one that drops her kids off at kindergarten and goes straight to the office. The one that has lunch with her clients, or attends yoga classes instead. The one that went trekking last Saturday, and enjoys Sunday brunch in this tiny new restaurant that just opened in town. If I love the adventurous spirit of the I.N.O.X. 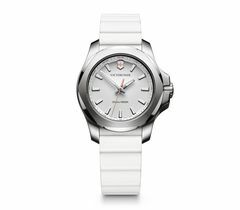 yet I wear a suit for work – which watch would be the best for me? Each I.N.O.X. collection addresses a specific need and speaks to a specific audience. Nowadays, people choose a watch that tells a story, as much as a watch that says something about them. 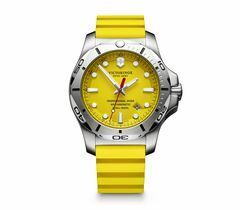 They want their watch to express their personality, their achievements, their taste. 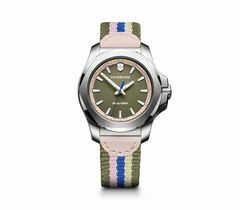 Let’s be honest, whatever their uncompromising quality standard, their unmatched functionality or their unparalleled innovation level, the first reason for people to buy a watch is style and design. To launch the I.N.O.X. one of the worlds toughest watches, we demonstrated how truly unbreakable it is. Will the I.N.O.X. break under the weight of a fire truck? Will the I.N.O.X. melt in boiling water? Will the I.N.O.X. leak in water when being washed in a laundry machine? Will the I.N.O.X. stop ticking when frozen into ice? Will the I.N.O.X. become unreadable when being hit by a sand blast?